Take a musical journey through funky rock, blues, dance grooves, and pop music. Jam packed with 20 original, eclectic and catchy songs there is bound to be something to appeal to your musical tastes on this great new CD. 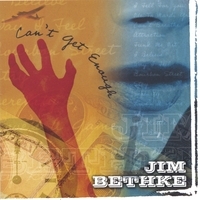 Jim Bethke is a singer/songwriter from Philadelphia, Pennsylvania. Jim has been playing in local bands and writing songs for 20 years. He currently has a recording studio where he provides production assistance to other local acts in addition to producing his own music. “Can't Get Enough” is Jim’s first commercially available CD. Jam packed with 20 unique songs, “Can’t Get Enough” was recorded entirely in Jim’s home studio with Jim performing virtually all of the music himself. The eclectic musical styles on the CD make it difficult to categorize but takes the listener through a wide range of emotional experiences. Jim’s list of influences includes artists as varied as Chris Isaak, INXS, Prince, The Beatles, Elvis, Billy Joel, David Bowie, The Fixx, Pink Floyd, Lyle Lovett and Dwight Yoakam. So with songs ranging from funky rock, to blues, to dance, and to pop ballads you are sure to find something that will appeal to your particular musical tastes. Songs like “Can’t Get Enough”, “Attraction”, “Stop!” and “Tell Me I’m Dreamin'” will have you dancing with their infectious, driving beats. “Ode To Mardi Gras” and “Bourbon Street” are rockin’ homages to one of the world's greatest cities while “I Fell For You”, “Stay” and “Love’s A Game” will satisfy your need for catchy, pop music. If it’s funk you crave, then jump quickly to “Funk Me Out” and “Fee-Fi-Fo-Funk”. Rounding out this musical smorgasbord are spirited and moving ballads like “Can’t Breathe”, “I Believe”, “Way I Feel”, Serenity” and “This Ring” which was specially written to be the First Dance at his wedding. The lyrics are clever and witty, the music has depth, and the production is very well done. If you like new music that doesn’t sound like every other song out there, then "Can't Get Enough" is definitely a CD you should check out.